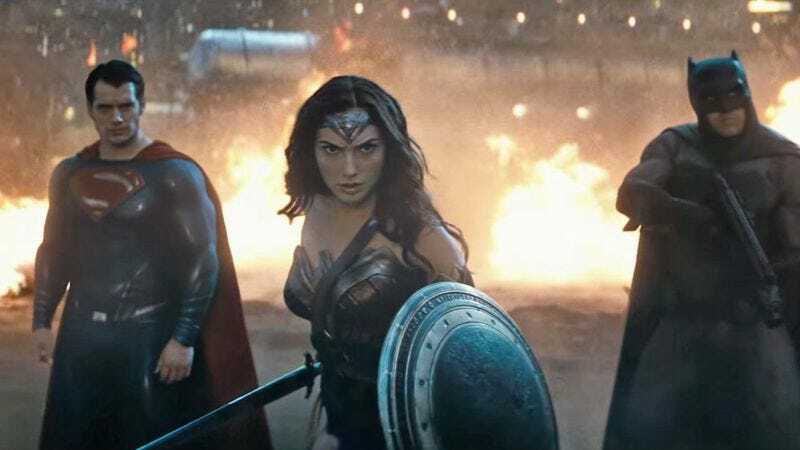 Zack Snyder and DC Entertainment seem to have realized that jettisoning some awkward punctuation and characters isn’t quite enough to pull the Justice League franchise out of a nosedive. So in addition to shedding extraneous clauses from its title, Justice League will now be a standalone movie, rather than a (potentially) dull two-parter. But according to Jo Blo, there are other changes being made to lighten the film, which will have a “fun ensemble” at its core. The events of Justice League will take place just months after those of Dawn Of Justice, [spoiler alert] Kryptonian coffin and all. The newly formed team will take on a common threat in a story that borrows from Jack Kirby and will “[revolve] around the quest for three Mother Boxes; one on Earth, one in Atlantis, and one in Themyscira.” And Kirby’s villainous creation, Steppenwolf, will serve as the Big Bad whose imminent defeat will lead to the big party that will help the Justice League really gel. Darkseid will be on the film’s periphery with just a chance of Lex Luthor popping up, assuming Jesse Eisenberg hasn’t been eliminated for talking about the possibility of his return in the first place. The set visit also yielded a bounty of Batman details, including the news that the Dark Knight will be upgrading his armor and his modes of transportation, which will place Bruce Wayne’s “Flying Fox” jet at the Justice League’s disposal. There’s also a rundown of everyone else’s heroic raiment: Cyborg’s will be outfitted entirely by CGI, Superman will have a mullet (we assume that’s the longer ’do he’s sporting), and Mera will have some fashionable yet functional chainmail. The Flash’s suit will be held together with duct tape—sorry, wire—and J.K. Simmons’ ridiculous biceps will be straining against the suits that will almost certainly make up Commissioner Gordon’s “classic look” in the movie. Jo Blo’s also confirmed that Willem Dafoe will in fact be playing a good guy. Dafoe’s role in the superhero-buddy film has been revealed as “Vulko, a mentor to Aquaman” who’s his champion early on in the comics. So Dafoe is probably practicing wearing a gentle smile and little else (you’re welcome for the mental image).